Canada 2015. Days 17 & 18 (Aug 15 & 16, 2015). 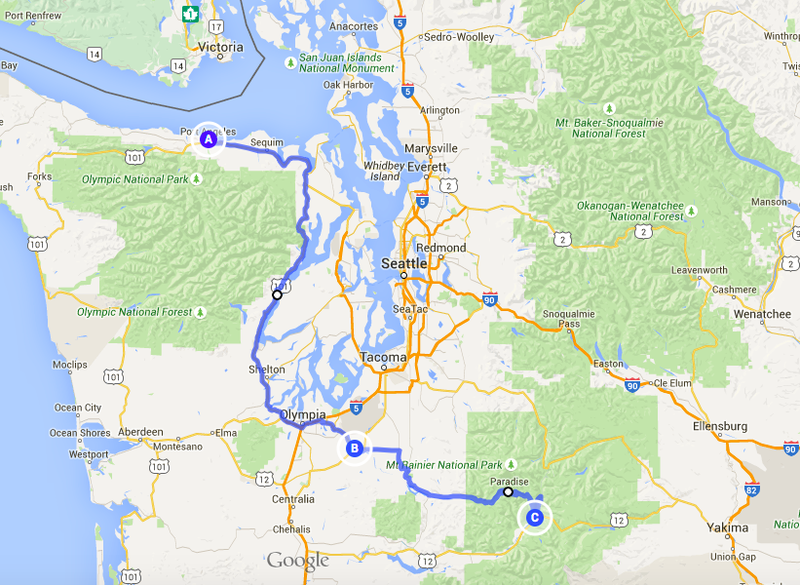 After breakfast in the hotel at Port Angeles we loaded the bikes and took US-101 east and then south towards Olympia, WA. It was a cloudy and cold morning but the ride was gorgeous. US-101 runs through dense woods along the eastern coast of the Olympic Peninsula facing the sea (the Hood Canal). We stop at a bay where several people were harvesting oyster at low tide. Each person carried a big bucket where they collected the harvest. We walked on the oyster beds for a while and Adrián even tried one. We got gas at Olympia and then stop at Yelm, WA, to get some supplies at an evil Walmart. We reached the Nisqually entrance of Mount Rainier National Park at around 2 pm. It was very cold and wet. We rode through the splendid trees of the park stopping at every campground hoping to find a place to camp. The sign at the park’s entrance indicated that all the campgrounds were full; a typical state-of-affairs for a summer weekend. We took a few pictures of the twisty road but the low clouds were hiding Mount Rainier from us. We had been here before and remembered the imposing presence of the big active volcano. By the time we got to Ohanapecosh, the last campground in our route, we had lost all hope of finding a place to spend the night inside the park. We rode thought Ohanapecosh to visit the campsite we had used with Lucas and Lucía a few years back and then headed south on Route 123. We had not driving much beyond the park boundary when we stumbled upon La Wis Wis, one of the hundreds of great National Forest campgrounds that can be found everywhere in the US. La Wis Wis was nearly full but we managed to find an open campsite. We pitched the tent and went to pay the 20 dollars fee to the campground host. He confirmed that we could stay in there until Monday. We were quite happy because La Wis Wis is as pretty as Ohanapecosh. We were cooking dinner when a woman in a little van stop at our site. She apparently had made a reservation for our site and was understandably very upset to find it occupied. She showed me the computer printout clearly indicating that Ms. Chen had reserved our site a long time ago. I suggested that she talk to the host. We were very worry that we would have to move all our stuff. Thankfully, the host found another spot for poor Ms. Chen. After breakfast the next morning we rode north on Route 123 to Sunrise, at the northeastern corner of Rainier. The view of the giant from Sunrise is truly spectacular. Inspired by the mountain we took a long hike. We stop for lunch (beef jerky, almonds, and dried apricots) at a lovely little lake on the trail. According to the map back at the parking lot of the visitor center at Sunrise, the loop we hiked was 6 miles long but I doubt it. It was good exercise though. After the hike we rode to Bumping Lake on routes 123 and 410. Route 410 is quite pretty. 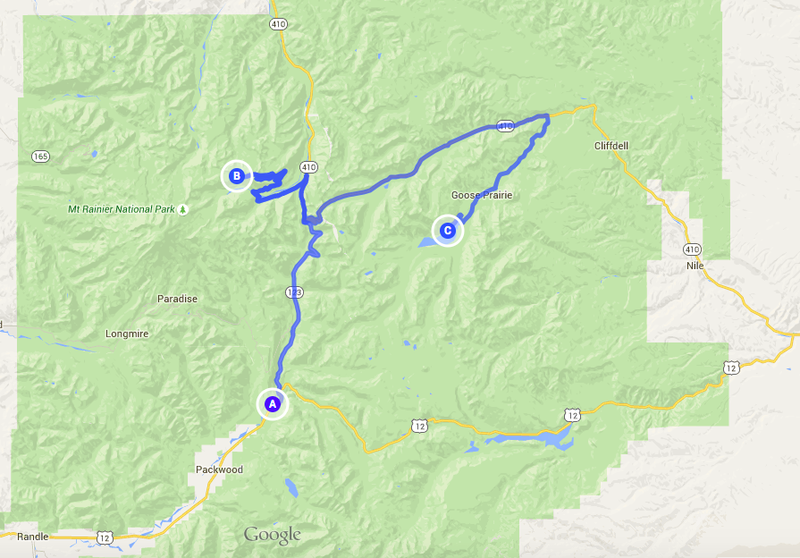 After crossing Chinook Pass (5,346 feet) to road goes down to Bumping River. The river drains the man-made reservoir called Bumping Lake. The level of the reservoir was quite low. There are quite a bit of campgrounds along the river and also by the lake. We stop to rest at one of the sites by the lake where we met Amy from Seattle and two of her friends whose name unfortunately we forgot. They were very friendly and invited us for a beer at their campsite. Amy proudly showed us her cute blue camper, which she is planning to use for a trip to Yellowstone in the fall. After talking to Amy and friends for a while we went by the lake to get some hydra; we did not find any. We rode back to the campground and made dinner (i.e. boiled two cups of water and pored it into the Mountain House pouch of Chicken with Rice). After dinner we went for a walk though the beautiful campground, which was almost empty on the Sunday evening.